From the time I learned that Sharon “Birdchick” Stiteler was coming out with a new book earlier this year, I looked forward to getting a copy. This book is to help you enjoy birds. I want to share with you insights of bird behavior — the spark bird that drives many of us to watch them. Most people love listing all the birds that they’ve seen because at the end of the day, bird-watching is more than a hobby. It’s an activity you can enjoy no matter where you travel to on the planet. It’s a scavenger hunt, and the objects fly and sometimes change color! It’s an adventure. But there’s so much more to enjoy about birds beyond seeing a new species. In addition to being a writer, blogger and a digisicoper, Sharon is also an avian field ecologist, has worked as a National Park Ranger, and started in the bird feeding industry (one of her earlier books is City Birds/Country Birds: How Anyone Can Attract Birds to Their Feeder). She also has a great sense of humor and is very creative (testing how waterproof scopes and binoculars are by taking a bath with them, and with one of the best birding podcasts out there). As you can see from all of her writing — online and in books — Sharon is passionate not just about birds but also about wanting as many people as possible to understand and appreciate birds. This passion, humour, and creativity, is what makes this book so good. In his introduction to the book, English ornithologist/naturalist and entertainer Bill Oddie (who a few years ago also wrote an introduction to birdwatching), writes, “I think I would go so far as to say that if I were to write a book about birds that was amusing, informative, and sometimes a bit rude, this would be it.” He says a little bit more, but you’ll have to read the book to find out what that is! The design of the book is very attractive (light and airy, not too dense with text) and all the photos are full-color. Sharon took most of the photos, many of which were digiscoped with her iPhone, and the rest were taken by her blog readers (disclosure: I submitted a few but none were accepted. However, some of my friend Dan Arndt’s photos were used). This book is a great choice for birders to give to the almost-birders in their lives, the family and friends you know who like birds but who might like to know more about them, even if it’s just some crazy bird trivia, or how to get more birds to come to the feeders in your yard. Even non-birders might become more favorably inclined to birds after reading this book — I found one of my younger brothers (who likes to call me a “bird nerd”) reading the book and enjoying it, although he will never admit it! 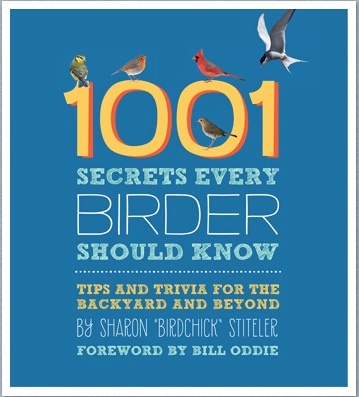 The book includes chapters on attracting and feeding birds, nesting and roosting (and bird houses), bird anatomy and adaptations, commonly asked questions about birds (“Why are those smaller birds attacking that hawk?”), migration, mating, how birds raise their young (including what Sharon calls some “lethal parenting methods”), and how to learn more about birding and bird watching. The back of the book also has a glossary, as well as a bibliography, a suggested reading list for different levels — Beginner, Knows more than the average bear, Hard-core maxi bird books, Articles and online resources. I think Sharon’s breezy and humorous writing voice, and the general layout of this book, make it suitable for all ages, from older kids to adults of all ages. And the book would also be a very good choice for libraries, as very a useful reference for those who are looking to learn more about birds and birding. I love bird-watching because there’s no right or wrong way to do it, and as long as you are’t wiping out a whole species by the way you enjoy birds, do what feels good to you. 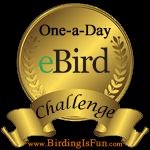 If you enjoy listing and categorizing every bird you see — that’s terrific. If you like to peek out your window and see a chickadee at your feeder — that’s great. … Just get out there and watch the birds. You can buy the book from your favorite bookseller or from Amazon.com. It’s also available for the Kindle edition. :: In some places, bumblebees steal bird nests, using their “buzz” to scare away the birds. :: Arctic Terns breeding in the Netherlands migrate to their wintering in Antarctica, by way of New Zealand! :: The Cornell Lab of Ornithology has released its Master Set of 4,938 downloadable bird songs, a project that has taken 80 years to complete. :: Many Atlantic Puffins are dying of starvation because of what scientists think is a shifting fish population and the rise of the ocean’s temperature. :: The Tommy Thompson Park Bird Research Station in Toronto banded its 2,500th bird for the Spring season earlier this week! And here is a story from CBC about the research station. :: From Timothy at Backyard Chirper: Birder vs. Birdwatcher: What’s in a Name? :: From Greg, guest writer for Birds Calgary: Frank Lake Ibis Colony Destroyed? :: My friend Marcel’s Baillie Birdathon results — featuring spudnuts! 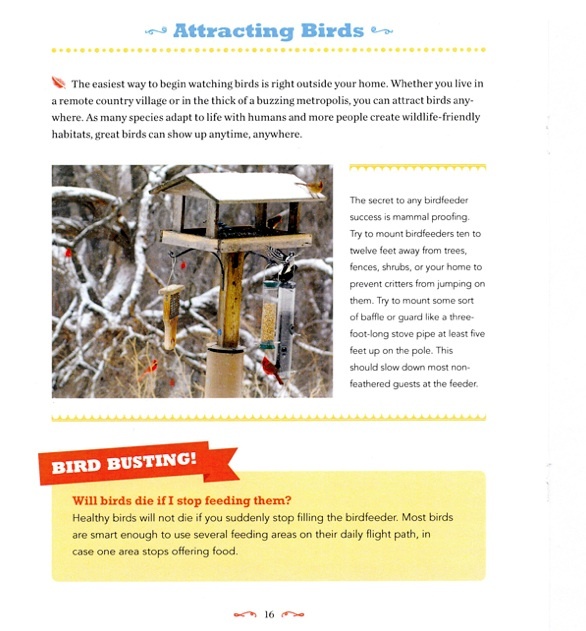 :: From Sharon, beat writer for 10,000 Birds: When is Baiting Birds OK? :: From Jennie at The Eyrie (the ABA’s young birder blog): Announcing the 2013 Young Birders of the Year! :: From 10,000 Birds: I and the Bird: What is a Heron? :: The New Zealand Storm Petrel, thought to be extinct until 2003, has been discovered breeding 50 km from Auckland. :: There have been 10 big discoveries because of geolocators on birds. :: An interesting golden colored redpoll has shown up in Alaska. :: The General Motors Company in Detroit is encouraging its employees to turn off their office lights at night to prevent bird collisions and deaths. :: As we already know, pesticides don’t do birds any favors, especially grassland species.